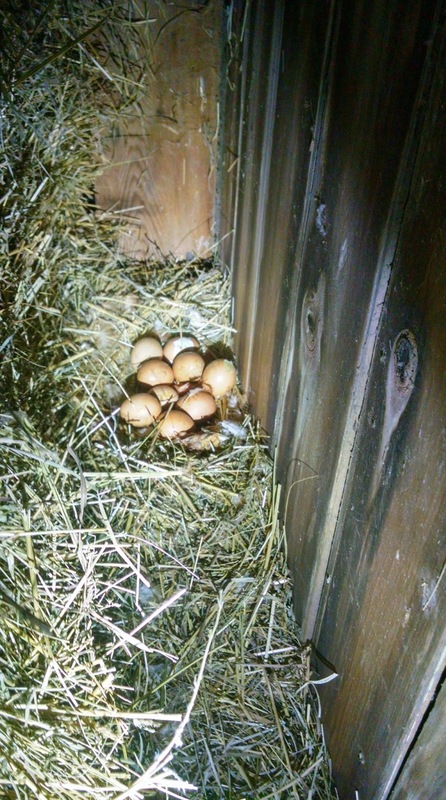 In the upstairs portion of our barn, not far from where a mother duck recently made a nest and hatched eleven ducklings, one of our Buff Orpington hens also hid a huge stash of eggs and went broody on them. How well hidden? She’d been there for weeks, and we didn’t even know it. It was an incredibly secure nest. The hen had squeezed in there, and did have a pathway out through the hay bales. Even when they’re broody and trying to hatch eggs, they take periodic breaks to get food and water. The problem is, the nest was too secure. There was absolutely no way the chicks could get out. They couldn’t follow Mother Hen through the hay – the climbs and jumps needed were far too large. Worse, they were in danger of falling off the support beam, and landing back behind the hay bales. This morning, once we were reasonably sure the hatching process was complete, one of our kids captured the loudly-squawking-and-clearly-upset Mother Hen. 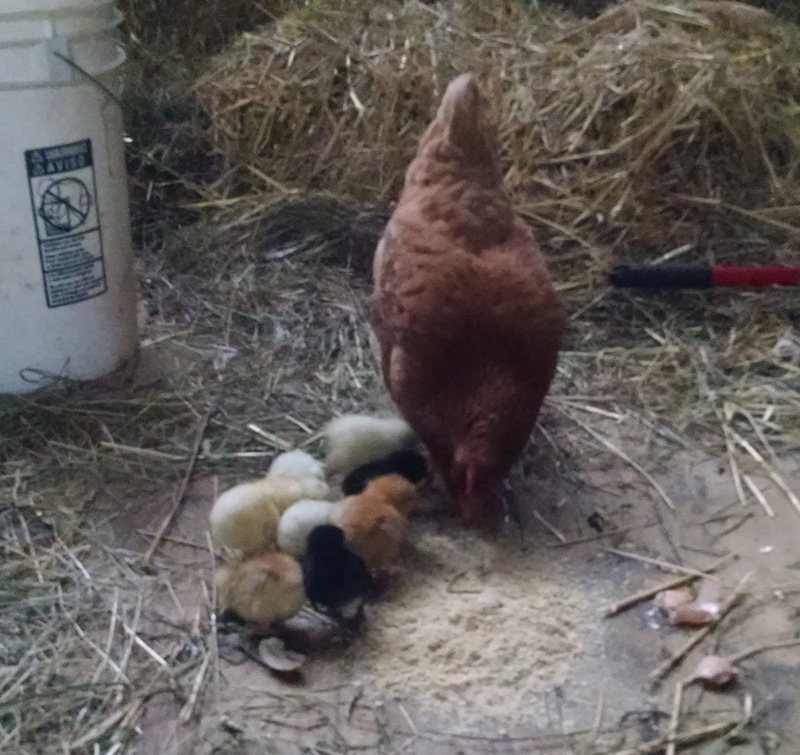 I somehow fished out the eight chicks she’d hatched, and carried them down to the barn floor. We then carefully set Mother Hen with the chicks, and put some layer feed down for them. Happy, excited clucks followed, as she demonstrated for her brood what needed to be done with this wonderful stuff we’d put out. I’m guessing the nest contained eggs from multiple hens. Either that, or Mother Hen had been bred by multiple roosters. There are a couple of chicks that look like purebred Buff Orpingtons. Two others are black. The others are white, or a mix of white and black. Doesn’t matter. Their eggs will all taste the same when they’re old enough to start laying. We let the Hen and her brood wander around the barn, and the grass outside, for a couple of hours. It was clear, however, that eight is at least a few too many for her to keep track of. Plus, it’s a pretty cool day. For safety, we packed her and the chicks up, and moved them to the same garden pen that the mother duck and her eleven ducklings have been occupying. So far, the two broods seem to be getting along. The pen appears to be plenty big for both groups. The two of us went back to the barn, flashlight in hand. I could hear the chick, too, but it was WAY down behind the hay. 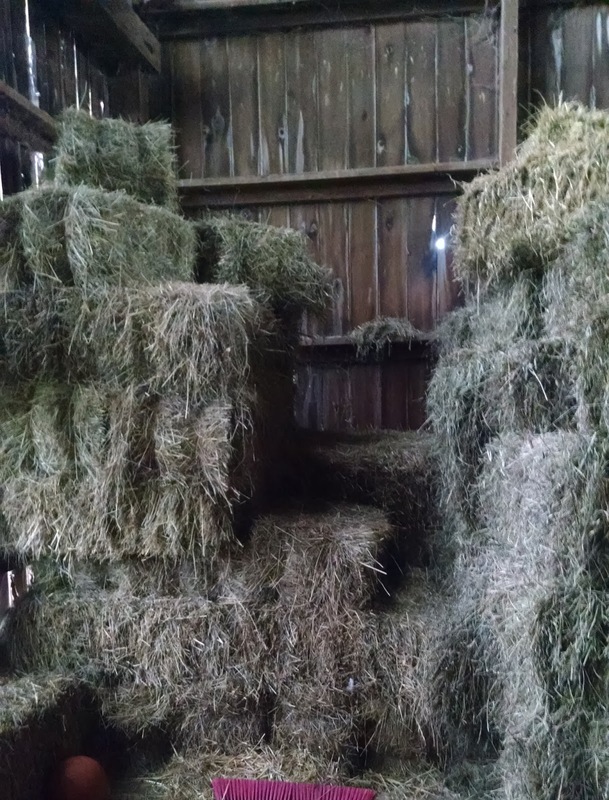 We began excavating bales, which toppled over into a haphazard pile in the middle of the barn. No matter. Those could always be re-stacked. Eventually, we moved enough bales so we could shine the flashlight into the tight little space between the remaining hay bales and the floor. And there, way in the corner, under some cobwebs and lots of loose hay, was a tiny white chick. I reached down and scooped it up. The first thing I noticed was how chilled the little thing was. We immediately took it out to the pasture pen in the garden, to rejoin the rest of the brood. It tottered toward Mother Hen, who did not peck at it or show any other signs of rejection. That’s a good start. Here’s hoping that Number Nine is no worse for the long isolation, and hits the garden ground running with the rest of the brood. So far so good. Every spring, the most frustrating battle we fight is with raccoons. They’re coming out after a long winter, many have litters of young to feed, and they’re all hungry. And our young birds make the perfect prey: small, utterly helpless, and delicious. For the last two weeks, we’ve had 56 baby birds in a secure brooder in the barn. It’s a 4×4 foot plywood box, two feet tall, with half the roof also of solid plywood. The other half is chicken wire, to allow fresh air, but even that wire is securely tied down most of the time to keep it cat-proof. (Think Sylvester and Tweety Bird; the barn cats love to hover on top of the brooder and gaze longingly at the young chicks inside.) Inside the brooder is a heat lamp, high protein (21%) poultry starter feed, and a two gallon watering fount. Most of the birds themselves (40) are cornish cross chickens, the most common commercial meat breed. They’ll be ready to butcher at 8 weeks. The other 16 are a light-colored egg laying breed; with the light-colored feathers, they’ll be easy to distinguish from the black-and-white Barred Rocks we raised last year. If we didn’t alternate colors, and always raised the same egg-laying breed, we’d never be able to tell how old the mature hens are. After two years, their productivity drops dramatically and they need to go in the soup pot. By staggering the breeds, we always know which batch of hens is due for butchering. 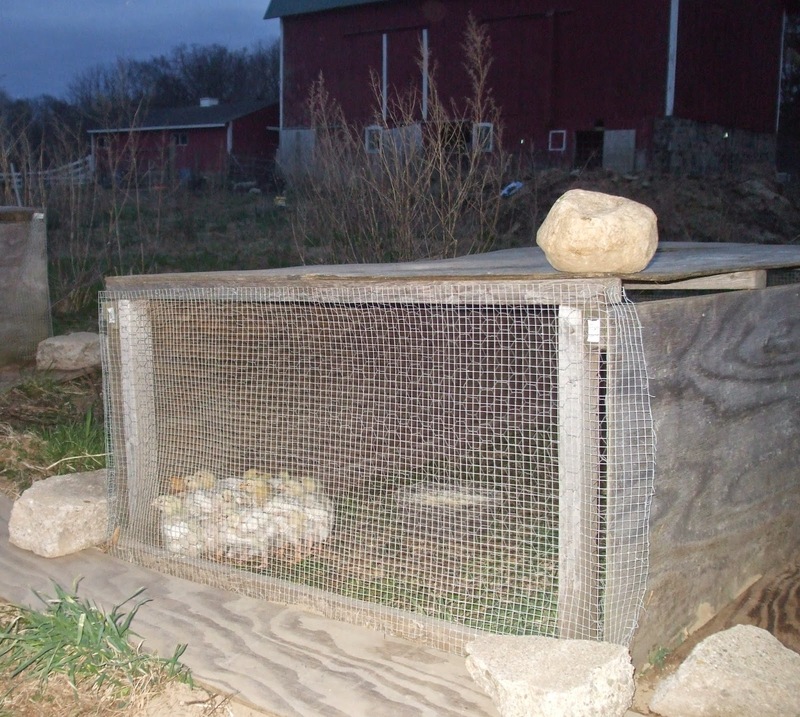 Anyway, we tend to move the chicks out to pasture pens at 10-14 days of age, when they’re feathered well enough to do without the the supplemental heat. We make the call as to the exact day based on the weather. If it’s sunny and warm, and no rain is forecast, they can go out as early as 9 or 10 days. (Birds we raise in the summer go out very early.) But if it’s in the mid 40s or 50s and dreary, as it is this week, we give them a few extra days to feather up. Yesterday was moving day. Our pasture pens are 4-foot by 8-foot, two feet high, with solid plywood running the length of each long side. The frames are 2x2s or 2x4s, but we tend to use the former a lot more than the latter; 2x4s are overkill, and make the pens too heavy. 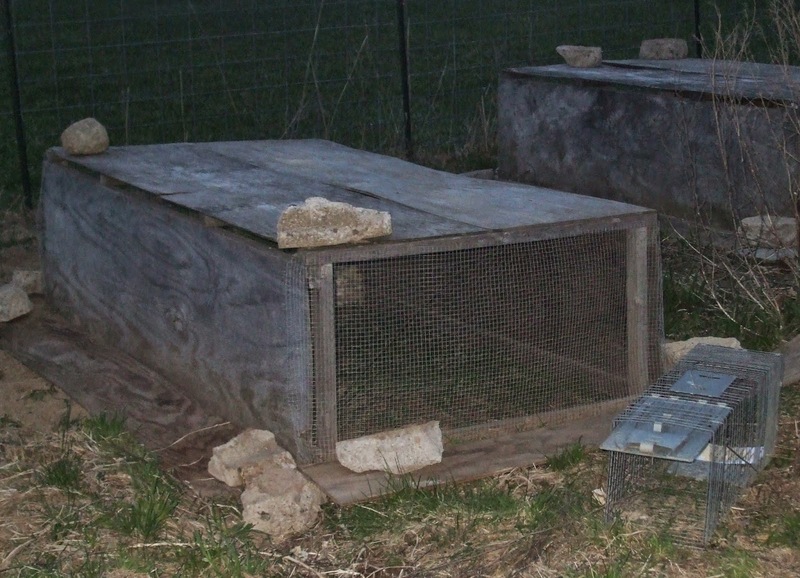 I used to cover the short ends of the pens with chicken wire, but the raccoons (remember the raccoons?) would simply rip the wire open. I’ve since covered all those short ends with an additional layer of small-mesh wire material. The smaller holes do unfortunately keep more insects out, but that’s a tradeoff we’re willing to make for raccoon protection. The tops of the pens consist of a full sheet of plywood, ripped in half. One half is screwed down to the frame; the other half just lays in place, weighed down by a couple of large rocks and/or by a bucket of chicken feed, until I need to open the pen to tend to the birds. The Yeoman Farm Children helped me haul two pens from one garden area, where the birds had been last year, to the area where Mrs. Yeoman Farmer wants them this year. 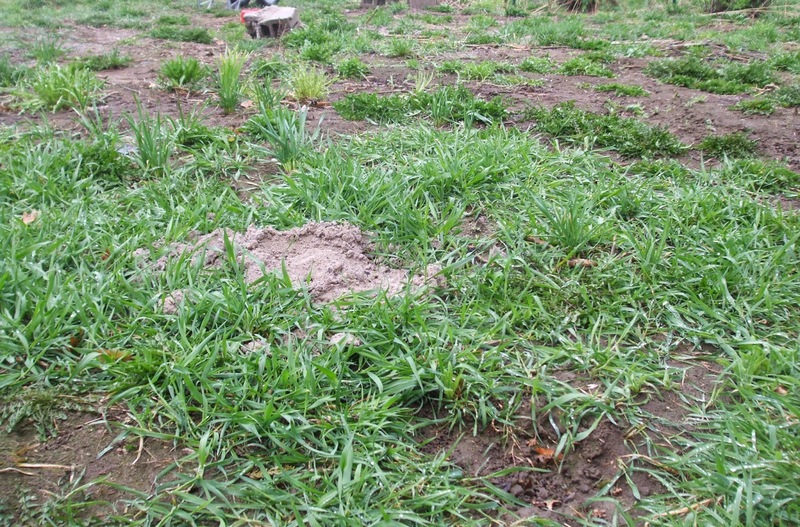 She identified a substantial swath of ground, currently covered in weeds, that won’t be needed for planting until late in spring. That will give the chicks several weeks to clear the weeds, all the while getting fresh greens in their diet as a supplement to their high-protein grain — and dropping lots of nice fertilizer onto the garden beds. It’s the perfect “tractor” system. We let the chicks mow down everything growing under the pen, then move the pen one length onto a new patch. And so forth. When they’re really little, it takes the birds several days to clear everything; later, they’ll easily clear the 4×8 area to bare ground in a single day. We would ideally let the chicken manure break down for a longer time, but MYF intends to use this area for squashes this year; squash goes in late, and isn’t as sensitive to “hot” manure as — say — tomatoes are. 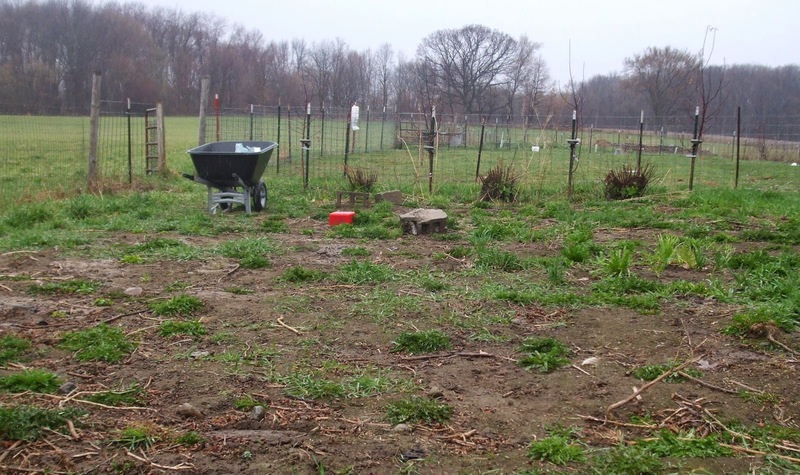 Last year, with MYF pregnant and largely out of commission, we reduced our garden planting substantially. We had a large, 24 foot-by-50 foot patch where pens could be moved all spring and summer. The pens with various batches of birds went around and around that area, wiping out every new little clump of weeds almost as soon as it appeared. When MYF was finally able to inspect the area last fall, she was blown away by how completely the birds had devastated it. And by how much manure the birds had provided. After a winter of sitting and breaking down, it’s going to be an excellent garden bed this year — once we clear out the weeds that are already coming up thickly in that nice, fertile soil. But then, learning from experience, I added some additional fortifications against raccoons. 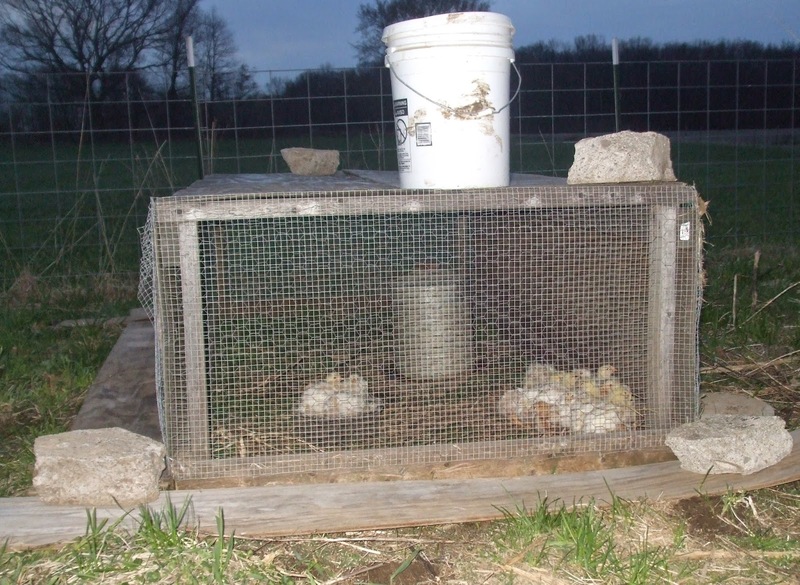 Last year, we lost more than two full pens worth of baby birds to multiple raccoon strikes; the most frustrating was the night when a raccoon wiped out a pen of very expensive baby turkeys — and only THEN turned to the grain in the trap and got caught. After the first couple of strikes, I’d added the steel mesh. So, the next raccoon simply dug his way UNDER the side of the pen, came in, and massacred everything he could find. What to do about soft garden soil? Feeling like I was back in a Cold War arms race, I hit upon the ultimate defense: a foot-wide strip of plywood, laid flat along every edge of every pen, and weighed down with large rocks. (One sheet of plywood, ripped into four equal strips, sufficed for each pen.) At last, success! Moving each pen was now a bigger production, but we didn’t lose a single bird to predators the whole rest of the year. Over the course of the evening, all the way up to midnight, I made a number of trips out to the garden to check on the birds. All were fine. No sign of any predators. But still, this morning, I held my breath as I went out to make my first inspection. To my great relief, everything was exactly as I’d left it the night before. Every bird was alive and active. And while it would’ve been nice to have caught a raccoon, even the trap was undisturbed. And so it goes. I’m just happy that another season of poultry production is off and running, and that we’re just six weeks away from our first backyard barbeque feast. It can be hard to find a good large-animal veterinarian. We were fortunate to have one just around the corner from us in Illinois, and who didn’t charge a fortune to come see us at the farm. Here, it took us awhile to locate a good vet who can see the livestock, but we did at last find one; most of his practice is dogs and cats, but he has good experience with farm animals. He will come out on farm calls, but it’s a fairly steep charge. Since every one of our animals is small enough to fit in a vehicle, we find it makes most sense to drive the 14 miles to his office. Which brings us to Button, the mother of Thistle. She had twin kids about a month ago, and has been producing an outrageous amount of milk. We’re talking basketball-sized udder, with teats like great big sausages. Plenty for the twins and us. Anyway, late last week, Button got some sort of scrape on her right teat. It wasn’t too big a deal, and the Yeoman Farm Children worked around it when they milked. We treated it with salve, and it was scabbing over. Problem was, the scab began growing and blocking the milk hole. This meant it had to be opened up a bit for each milking. Which was fine…but on Sunday morning we found the hole simply would not open. We tried everything we could, but didn’t want to hurt her; we were concerned that scar tissue might be forming. Mrs Yeoman Farmer called the vet, who was willing to see Button on a Sunday — but there would be a substantial “emergency fee.” We were grateful for the option, but knew Button would be fine (if a little full) until Monday morning. The plan was to get Button packed up and to the vet as close as possible to his 8am opening time; he sees walk-ins from 8-10 on most mornings, so we wanted to be first in line. Unfortunately, as Homeschooled Farm Girl and I were moving Button out of the barn to our van, the goat’s engorged teat caught on a piece of fence and tore the skin. Great. One thing after another. Now quite worried, and somewhat delayed, we sped off to the vet. We turned out to be second in line, and got in to see him after just a short wait. Must be interesting being a country vet; the person ahead of us was an elderly lady getting her pet dog’s toenails trimmed. 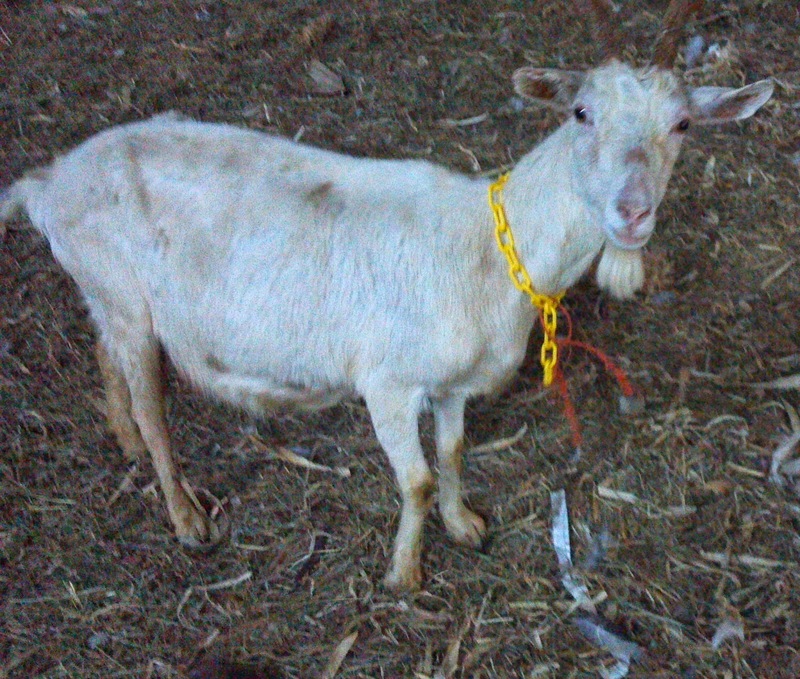 Then us, with a dairy goat with a torn teat! Anyway, the vet was a bit taken aback at first by the wound, but then got right to work computing how much anesthesia Button would need. He gave her a little shot, she collapsed in a heap, and then I helped the vet lift Button onto a work table. First order of business was to clean the teat and bathe the cut with some sort of antibiotic cream. He then needed to drain the teat, which he did by inserting a catheter and then putting a bowl under it to catch the milk. After all the work we usually have to do, expressing milk, it was amazing to see the stuff all come running out like through a faucet. I even joked that we’d better not let our children see this process, or they’ll ask if they can start catheterizing the goats every time they go out to milk. With the teat going flaccid, and with me holding Button’s leg so she wouldn’t interfere with his work if she twiched, he began suturing the cut closed. He explained that he was leaving plenty of loose skin, so the teat would be able to expand with milk. It took him just a few minutes to get everything done. Then, since the anesthetic still had Button nearly entirely knocked out, he took advantage of the opportunity to give her hooves a good trimming. “It’s a lot easier when they can’t kick!” he joked. This whole time, my daughter had been sitting in the quiet waiting room, doing school work. Once Button awakened, the vet and I called Homeschooled Farm Girl back and explained the situation. Button would need to be milked several times per day, to make sure the re-opened teat remained open and didn’t scar over. This would need to be done gently, taking care not to stress the sutures. And we would obviously need to keep Button totally separated from her kids for the next ten days or so. HFG happily volunteered to take on the management of the situation, all the way from milking Button to bottle-feeding that milk to the twins. Needless to say, it’s very gratifying whenever one of your children takes that kind of initiative, without any kind of “bargaining” or questioning what might be in it for her. It just needs doing, and she wants to take charge of it. So, after a wild morning, we’re all back home on the farm. Just another crazy day in our life. This morning, I dropped a couple of checks in the mail: one to the U.S. Treasury and one to the State of Michigan. Like most people who are self-employed, I make quarterly payments for the year’s estimated taxes; the deadline for 4Q 2011 is today. If you’re an employee, your federal and state taxes are automatically deducted from each paycheck. You never see the money. Oh, sure, you’ll see the line item on the pay stub for the deducted taxes…if you look for it. But if you’re like I was when I was an employee, you probably have your check directly deposited into a bank account and never bother looking at the paper pay stub. You confirm that $X shows up in your account, and you think of $X as the amount you “get paid.” Seldom, if ever, do you think about the amount you never saw. Then, after you file your taxes in March or April, chances are good that you’ll receive a sizable refund check for the amount of tax that you overpaid during the course of the year. Ever stop to think about that? You’re giving the government an interest-free loan from every paycheck. Then you get this big check, which you then probably think of as “bonus” that you can use for something special. The bigger the “bonus,” the happier you probably are. It should be the opposite: the bigger the refund check, the more troubled you should be at the size of the interest-free loan you provided. But, human psychology being what it is, the government knows that’s not how you’ll react. You never saw the tax deductions all year. You never thought about what you never saw. Now you get a chunk of it, all at once, in a lump sum, courtesy of the U.S. Treasury. Isn’t that great? Contrast that with the experience of the self-employed. You deliver a project for a client, and get a check at some indeterminate time in the future. You deposit this money in a bank account, where you see it and control it all quarter. You spend some of it. You think about what else you’d like to spend it on. And then, at the end of the quarter, you must sit down and write a check relinquishing a portion of those funds to the United States Treasury. It was yours. You held it in your hands. You thought about what you could do with it. And then you turned it over to the government. When you’re making these quarterly payments, you try to make each one as small as legally possible — and are happy when you sit down in April to do your taxes and discover you owe additional money to the government. That means you didn’t overpay, and didn’t provide an interest-free loan. But even if you have an unexpectedly large number of deductions in a particular year, and overpaid Uncle Sam, you don’t even think about requesting a refund check. Instead, you apply the overpayment to the next year’s tax bill. It becomes part of your first quarter estimated tax payment. Why do I raise this topic? I love being self-employed, and the independence that goes with it. But it’s remarkable how much the experience has changed my perspective on taxes and government spending. The more of these quarterly payments I’ve made, the more personally I’ve come to view government spending. The dollars government spends seem much more like my dollars now, in a way they did not when my paychecks were getting directly deposited with deductions automatically taken. The local freeway resurfacing? The aircraft carrier? Ethanol subsidies? Payouts to failed solar panel manufacturers? Subsidies to buyers of electric cars? The person in line ahead of me at the grocery store, who pays for a cartload of junk food with an EBT card before whipping out a wad of cash to pay for their beer? Whether I approve of any of these particular expenditures or not, they represent dollars that used to be in our family’s bank account. And I remember writing the check which turned them over for the government to use in these ways. That is much more real to me now than it was before, and much more real than I think it is to those who never see the deducted dollars at all. For the record, I don’t think our family is overtaxed. I happen to agree with Oliver Wendell Holmes that taxes are the price we pay for civilization. I’m happy to see the government provide a strong national defense, build and maintain roads, and fulfil the rest of its core functions. But the experience of writing quarterly checks has made me much more attentive to “everything else” the government spends money on — and has led me to question those priorities to a much greater degree. Try a thought experiment: imagine that, starting this year, every working American received every penny of his or her paychecks. And then had to sit down once a month and write a check to “United States Treasury” for the same amount that is currently being deducted. And a second check to their state or local tax authority. I’m guessing we’d see much more vocal pushback against government spending at all levels. And maybe even a political revolution that restores truly limited government. Which is why automatic tax withholding will never be eliminated. But we can still dream, right? We’ve consciously decided to avoid the typical team sports that involve shuttling kids all over creation to attend practices, games, and tournaments. Sure, baseball, hockey, football and soccer have value and can be quite healthy. But the schedules can consume enormous amounts of time that could be better spent with family; we’ve seen this happen to a number of our friends. If it’s true that an addict is the last to recognize his own addiction, that may be especially so when the compulsion is ostensibly healthy. But rock bottom is rock bottom, and mine came on November 20, 1999 — appropriately enough, near the lowest geographic point in North America, on one of the country’s most isolated roads. And for those who have been asking about my plans for a second novel, I do have a story in the works. 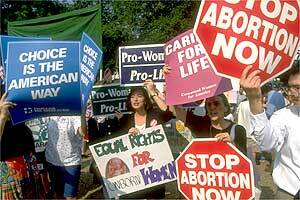 The general plotline is inspired by the events recounted in this MercatorNet piece. I’ve finished a complete first draft, and the editor (and other initial readers) have sent me suggested changes. I am in the process of incorporating those edits now; I am hoping to have a final version for publication sometime next year. 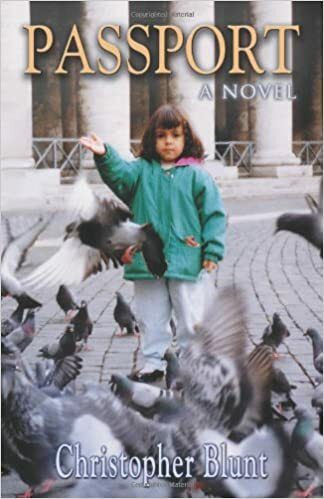 In related news, my first novel, Passport, is now available in e-book format through the Amazon Kindle Store (for just $2.99). Also, Amazon has temporarily reduced the price for the print edition to $13.45; it can be found by clicking on the image below. Seriously, that’s the lesson you learn pretty quickly on a farm. We bought a large bulk pack of it at Sam’s Club some time back, and I’m glad to never have a shortage. It proved itself particularly handy a little over a week ago. 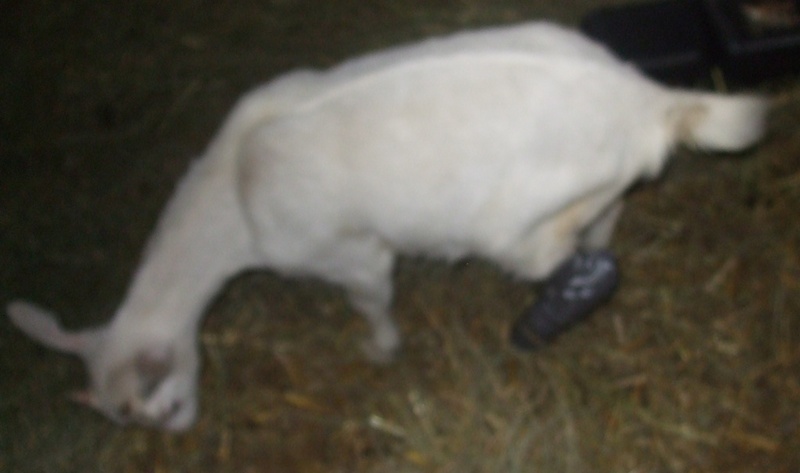 About two weeks ago, Puddles the Goat Kid somehow managed to break her left rear leg, down close to the foot. I tried splinting and bandaging it, but the whole thing came off in fairly short order. She didn’t seem to be in a lot of pain, and was getting around well on three legs, but I didn’t want to leave the leg untreated. So, a week ago Tuesday, I took her to the vet to have it done “right.” I figure we’ve spent enough time and effort (and milk) bottle-feeding her, we might as well invest a little more in getting her leg correctly set. Puddles was a huge hit in the waiting room, and got lots of attention from those with dogs and cats. It took a long time for the vet to get to her, but he splinted and bandaged her leg beautifully. I left his office confident that Puddles would heal nicely, and that our $60 was well spent. And then, last Wednesday afternoon, the splint was off. Yes, the whole thing had simply slid off her leg. I took her and it back to the vet on Thursday, waited for a long time with lots of dog-and-cat people, and he re-splinted her leg but with more bandages and tape. And only charged me $10. And, by 6pm, the whole thing had slid right back off her leg. Rather than spend my Friday morning back at the vet’s office, I recruited one of the Yeoman Farm Children to help me splint Puddles’s leg myself. I’d watched the vet enough times now to understand the general principles — and watched Puddles lose the splint enough times to know I had to do something different as well. And that something was DUCT TAPE. I splinted and bandaged the leg much as the vet had (fortunately, her leg was already starting to fuse, so it wasn’t necessary to align the bone). Then, I basically mummified the entire thing with duct tape — and didn’t stop at her knee. I kept wrapping her, all the way up to mid-thigh. “Just try slipping this thing off!” I told her, as she limped across the floor of my office. And Puddles is doing much better. She’s actually trying to rear up and place weight on both of her rear legs. I’ll keep it on her for the next week or so, to make sure it’s healed, but I’m very optimistic. And now an even bigger believer in the power of duct tape. One consequence of having kids with food allergies, and who can eat basically only one grain, is that we take a hit when the price of that grain spikes. 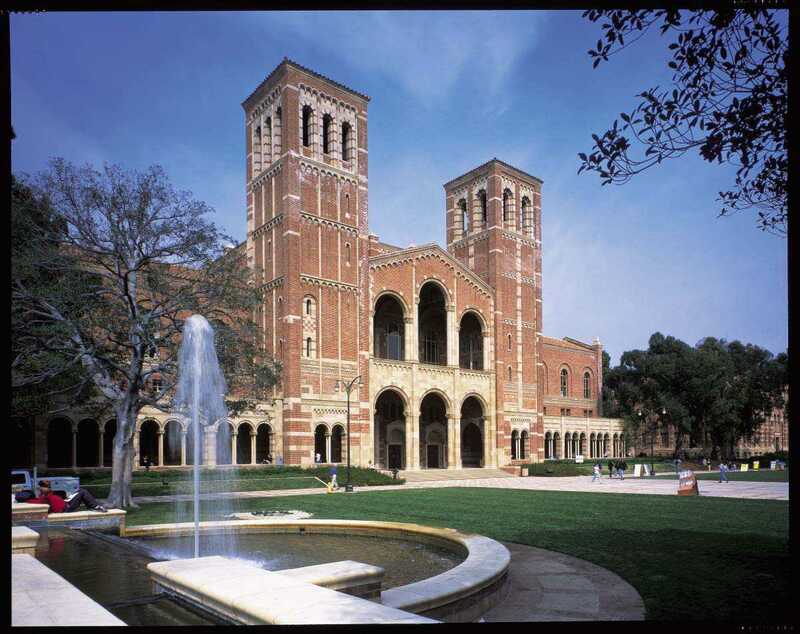 Given the role of rice as a worldwide staple for so much of the planet’s population, supply disruptions or crop failures in one part of the world can ripple through to impact the prices of grain we buy from California. For that reason, we try to maintain a prudent supply of bulk rice at our house, packed and stored securely to keep out moisture and rodents, as a hedge against price fluctuations. If the cost jumps temporarily, as it did during a panic in early 2008, we’re not over a barrel. We have some flexibility to wait the market out. We’ve been concerned for some time now about the reckless behavior of the Federal Reserve, and its massive printing of money through “quantitative easing,” and the impact this could have on commodity prices. Oil is now over $90 per barrel, and we’re all seeing the effects at the gas pump. Agricultural commodities have been rising significantly as well; you can see that for yourself by checking prices at the Chicago Board of Trade. But here’s a more personal anecdote: a month or two back, the woman who manages the local grain elevator told me that so many farmers around here have tried to cash in on soaring commodity prices, by bringing loads of corn and soybeans to the local elevator, the elevator ran out of capacity. They actually had to turn farmers away, or send them on to other elevators. But it was obviously a problem for everybody. While gold “may go down for awhile,” the metal is “going to go over $2,000 in this decade,” [Jim] Rogers [chairman of Rogers Holdings], who owns gold, silver and rice, said today during a presentation to business executives in Chicago. Gold touched a record $1,432.50 an ounce in New York on Dec. 7. The price closed today at $1,387. Agricultural commodities are “going to boom” as demand increases in developing markets, primarily in Asia, he said. All commodities will be supported by the weakening dollar, which is losing value because Federal Reserve Chairman Ben S. Bernanke is “printing money” by buying Treasuries in an effort to shore up the U.S. economy, Rogers said. Rogers said he doesn’t own shares in U.S. companies and is short U.S. long-term treasury bonds. The Chinese renminbi may provide “almost sure profits over the next five to 10 years,” he said. Needless to say, I’m grateful that Mrs. Yeoman Farmer laid in a good supply of rice at last year’s prices. We may try to get some more at our next co-op order. If there is some grain or other commodity that your family depends on, I’d recommend you think about investing in a good supply of it now while the prices are relatively reasonable. It wouldn’t surprise me if coffee prices, for example, increase significantly; coffee is produced almost exclusively overseas, and its prices can therefore be influenced by currency valuations. I personally can’t live without coffee, and for that reason have invested in a prudent supply from Sam’s Club. For most of us, this kind of practical move makes a lot more sense than trying to buy a commodity contract on the Chicago Board of Trade. There’s really no downside, other than the lost opportunity to invest the money in something else. Commodity prices certainly aren’t going to be decreasing. And we’re eventually going to consume these stored products anyway. And for those of you who don’t yet have your own farm: note well the final portion of the Bloomberg excerpt above.